After opening use within 3 days. Prior to use remove the plastic from around the crab stick. Description: “CRAB STICKS” are a crab flavoured surimi product, which is white, lightly greyish or yellowish in colour, juicy and with a pleasant crab aroma. The product is covered on the outside by red food colouring, is tubular, spiral and with a diameter of 2-2.5 cm, with a slightly crisp texture, and the best conveyor of the taste is its juiciness. “CRAB STICKS” are a crab meat substitute and are intended for use in the preparation of a number of different mixed salads together with various sauces. The product is extremely well-suited for use in the preparation of divided trays, sandwich cakes, pizza toppings and cold sauces. Ingredients: surimi 40% (fish protein, sugar, stabiliser: polyphosphate), water, potato starch,egg white, rapeseed oil, salt, sugar, flavourings (contains crustaceans and molluscs), soya, stabiliser: carrageenan, monosodium glutamate, food colourings: titan dioxide, paprika oleoresin, carmine. Nutritional information 100 g: Energy content 408 kJ / 96 kcal; fats 0.7 g, of which saturated fatty acids 0.1 g; carbohydrates 15.5 g, of which sugars 3.8 g; fibres 0.6 g; proteins 6.7 g; salt 1.8 g.
“CRAB STICKS” are a crab meat substitute and are intended for use in the preparation of a number of different mixed salads together with various sauces. The product is extremely well suited for use in the preparation of divided trays, sandwich cakes, pizza toppings and cold sauces. 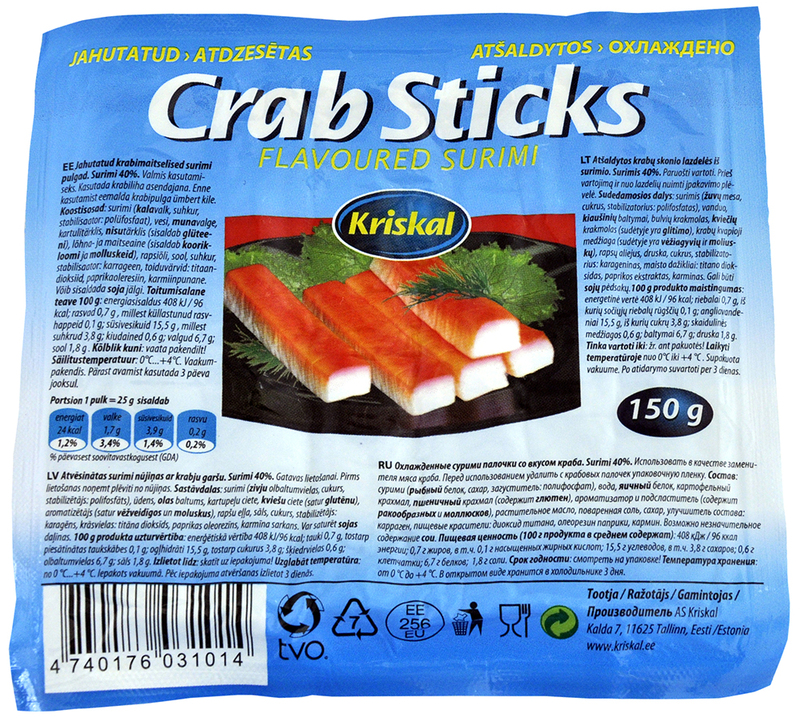 Ingredients: surimi 40% (fish protein, sugar, stabiliser: polyphosphate), water, egg white, potato starch, wheat starch (contains gluten), flavourings (contains crustaceans and molluscs), rapeseed oil, salt, sugar, stabiliser: carrageenan, food colourings: titan dioxide, paprika oleoresin, carmine. May contain traces of soya. Description: “SHRIMP NOODLES” is a shrimp flavoured surimi product, which is white, lightly greyish or yellowish in colour, juicy and with the pleasant aroma of shrimp, comes in the shape of noodles or threads, with a diameter of 2-2.5 mm and covered with red food colouring. The product has a slightly crisp texture and is juicy, used for conveying the taste of shrimp in various mixed salads. 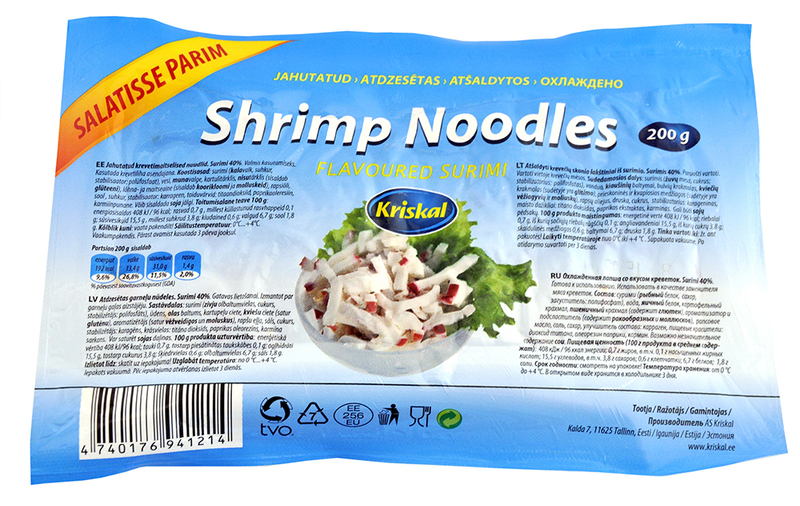 “SHRIMP NOODLES” are intended as a flavour substitute for shrimp in a number of different finer textured mixed salads, such as the preparation of noodle or macaroni salad along with various sauces. The product is well suited for use in the preparation of sandwich cakes, pizza toppings and cold sauces with curds or cottage cheese. Ingredients: surimi 40% (fish protein, sugar, stabiliser: polyphosphate), water, potato starch, egg white, rapeseed oil, salt, sugar, flavourings (contains crustaceans and molluscs), stabiliser: carrageenan, soya, monosodium glutamate, food colourings: titan dioxide, paprika oleoresin, carmine. Description: “SHRIMP NOODLES” is a shrimp flavoured surimi product, which is white, lightly greyish or yellowish in colour, juicy and with the pleasant aroma of shrimp, comes in the shape of noodles or threads, with a diameter of 2-2.5 mm and covered with red food colouring. The product is juicy, with a light, crispy texture and can be used in a number of different areas, limited only by the imagination of the consumer. 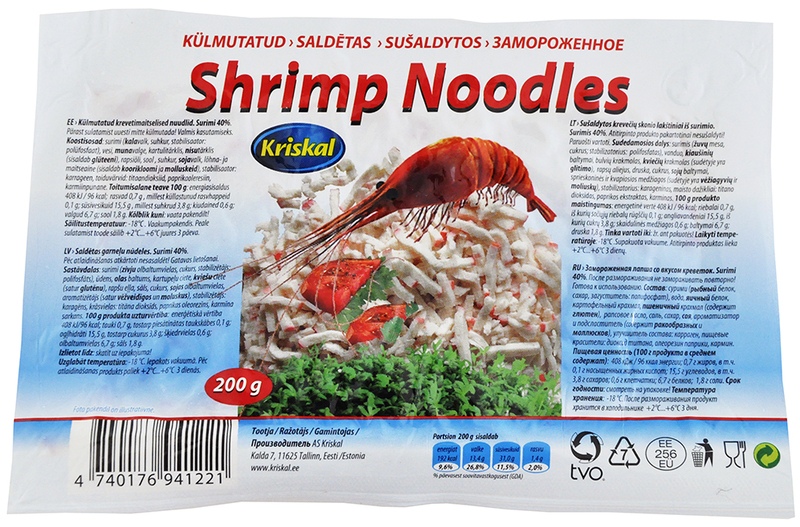 “SHRIMP NOODLES” are intended for use as a flavour substitute for shrimp and can be used in a number of very different ways, such as a stuffing for hamburgers along with salads and sauces, in the preparation of rolls with different types of fillings, as a sandwich topping, etc. Ingredients: surimi 40% (fish protein, sugar, stabiliser: polyphosphate), water, egg white, potato starch, wheat starch (contains gluten), rapeseed oil, salt, sugar, soya, flavourings (contains crustaceans and molluscs), stabiliser: carrageenan, food colourings: titan dioxide, paprika oleoresin, carmine. Description: "SMOKED SALMON STICKS” are a smoked salmon flavoured surimi product, reddish-orange in colour, juicy, and with a pleasant smoked salmon smell. The product contains natural smoked salmon, is tubular, spiral, has a diameter of 2-2.5 cm, is slightly crisp in texture, and the juiciness best conveys the taste. “SMOKED SALMON STICKS” are intended for use as a smoked salmon substitute in the preparation of a number of bigger textured mixed salads together with various sauces. The product is extremely well suited for use as a component in divided trays, and the preparation of sandwich cakes, pizza toppings and cold sauces. Ingredients: surimi 40% (fish protein, sugar, stabiliser: polyphosphate), water, potato starch, egg white, rapeseed oil, natural smoked salmon, salt, sugar, flavourings (contains crustaceans and molluscs), stabiliser: carrageenan, soya, monosodium glutamate, food colourings: titan dioxide, paprika oleoresin, carmine. Description: “SHRIMP FILLET” is a shrimp flavoured surimi product, which is white, lightly grey or yellowish in colour, with the pleasant smell of shrimp and a red stripe from the edge. The shape is rectangular, with slices of 2-3 mm in thickness. The product is juicy, with a light, crispy texture and can be used in a number of different areas, limited only by the imagination of the consumer. “SHRIMP FILLET” is intended for use as a flavour substitute for shrimp and can be used in a number of very different ways, such as a stuffing for hamburgers along with salads and sauces, in the preparation of rolls with different types of fillings, as a sandwich topping, etc. Ingredients: surimi 40% (fish protein, sugar, stabiliser: polyphosphate), water, potato starch, egg white, rapeseed oil, sugar, salt, flavourings (contains crustaceans and molluscs), soya, stabiliser: carrageenan, food colourings: titan dioxide, paprika oleoresin, carmine. Description: "CRABMEAT” is a crabmeat flavoured surimi product, which is white, lightly grey or yellowish in colour, with the pleasant smell of crab, comes in the shape of noodles or threads, has a diameter of 2-2.5 mm, and is covered from the ends with red food colouring The product is juicy, with a light, crispy texture, used to convey the flavour of crabs in various mixed salads. “CRABMEAT” is intended to serve as a crab flavour substitute in various finer textured mixed salads, such as the preparation of noodle or macaroni salads along with various sauces. The product is especially well suited for use in the preparation of sandwich cakes, pizza toppings and cold sauces with curds or cottage cheese. Description: “CRAB NOODLES” is a crab flavoured surimi product, which is white, lightly greyish or yellowish in colour, juicy and with the pleasant aroma of crab, comes in the shape of noodles or threads, with a diameter of 2-2.5 mm and covered with red food colouring. The product is juicy, with a light, crispy texture, used to convey the flavour of crabs in various mixed salads. “CRAB NOODLES” is intended to serve as a crab flavour substitute in various finer textured mixed salads, such as the preparation of noodle or macaroni salads along with various sauces. The product is especially well suited for use in the preparation of sandwich cakes, pizza toppings and cold sauces with curds or cottage cheese. 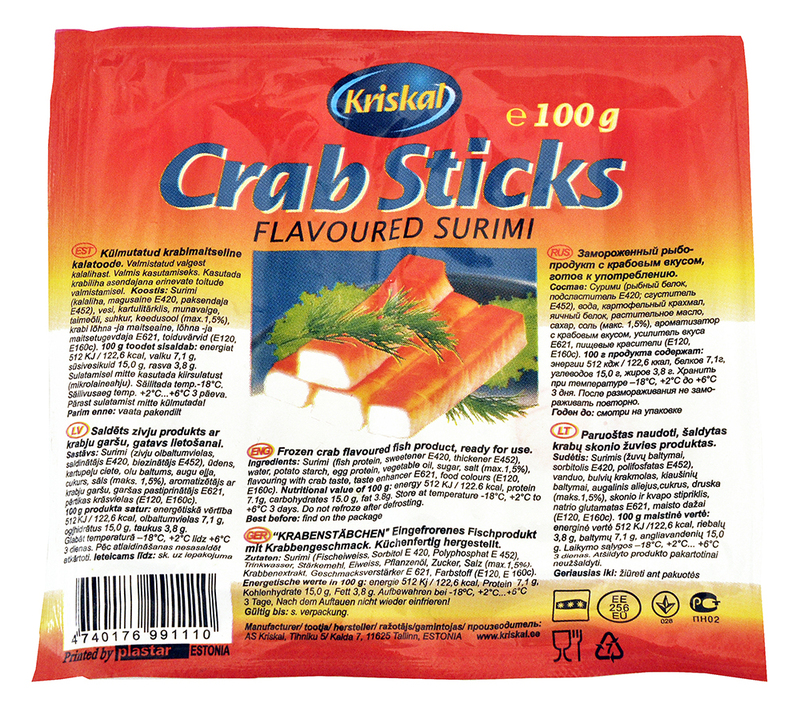 Ingredients: surimi 40% (fish protein, sugar, stabiliser: polyphosphate), water, egg white, potato starch, wheat starch (contains gluten), rapeseed oil, salt, sugar, soya,flavourings (contains crustaceans and molluscs), stabiliser: carrageenan, food colourings: titan dioxide, paprika oleoresin, carmine. Description: “CORAL CRAB” is a crab flavoured surimi product, which is white, lightly grey or yellowish in colour, with a pleasant crab smell to it, is covered with red food colouring, is cube shaped, and has a diameter of 2-2.5 mm. The product is juicy, with a light, crispy texture, used to convey the flavour of crabs in various mixed salads. “CORAL CRAB” is intended for use as a crab flavour substitute in various larger textured mixed salads, such as the preparation of larger textured macaroni salads along with various sauces. The product is especially well suited for decorating sandwich cakes, for preparing pizza toppings and cold sauces, as a component of divided trays and the preparation of salads along with feta cheese, salad or Chinese cabbage, paprika, grapes and olives. With the help of “Coral Crab” large-scale salads can be made beautiful and tasty. Description: “ISLAND” is a surimi product, a crab and chanterelle flavoured mixed salad, which is white and yellow in colour, with a pleasant crab and chanterelle smell, is noodle or thread shaped with a diameter of 2-2.5 mm. The product is juicy, with a light, crispy texture, used to convey the flavour of crabs and chanterelles in different salad mixes. The salad mix is covered with a basil and red paprika décor, which gives a gentle added smell and flavour to mixed salads. Mixed salad “ISLAND" is intended as a crab and chanterelle flavour substitute in different types of finer textured salad mixes, such as the preparation of noodle or macaroni salads along with various sauces. The product is especially well suited for use in the preparation of pizza toppings, and in the preparation of cold sauces with cottage cheese and curds. Description: “CRAB ROLLS” are a crab flavoured surimi product, which is white, lightly grey or yellowish in colour, with a pleasant crab smell, covered with red food colouring, is tubular, stick shaped, and a has a diameter of 2-2.5 mm. The product “CRAB ROLLS” contains a filling comprised of a mix of grated cheese and mayonnaise. In terms of texture the product is lightly crispy and juicy, possessing a unique crab and cheese flavour bouquet. “CRAB ROLLS” are ready for immediate use after being slowly thawed. The product is especially well suited for use in making divided trays and sandwich cakes, or other cool hors d'oeuvres. 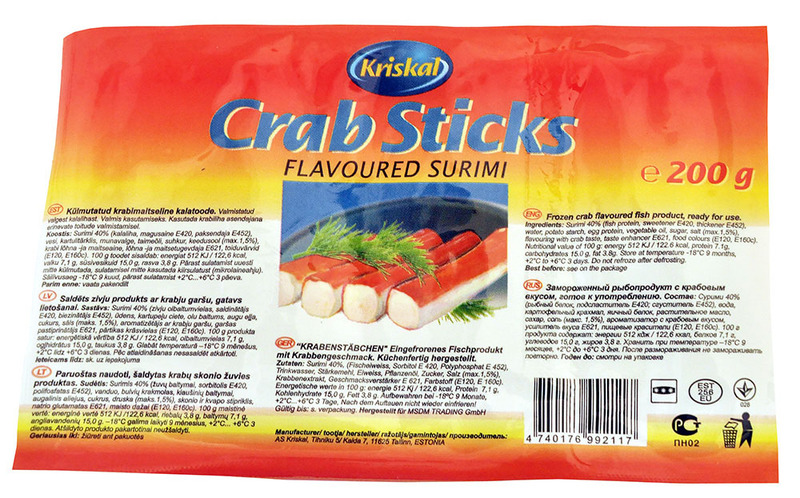 Ingredients: surimi 40% (fish protein, sugar, stabiliser: polyphosphate), water, egg white, potato starch, wheat starch (contains gluten), rapeseed oil, salt, sugar, soya, flavourings (contains crustaceans and molluscs), stabiliser: carrageenan, food colourings: titan dioxide, paprika oleoresin, carmine. Filling ingredients: cheese and mayonnaise, accounting for up to 10% of the product. Description: “SMOKED EEL” is a smoked eel flavoured surimi product, light brown in colour, with a pleasant eel smell, noodle or thread shaped, with a diameter of 2-2.5 mm, covered from the ends with brown food colouring. The product is juicy, with a light, crispy texture, used to convey the flavour of smoked eel in various mixed salads. “SMOKED EEL” is intended as a smoked eel flavour substitute in different types of finer textured mixed salads, such as the preparation of noodle or macaroni salads along with various sauces. The product is especially well suited for use in the preparation of sandwich cakes, pizza toppings and cold sauces together with curds and cottage cheese. Ingredients: surimi 40% (fish protein, sugar, stabiliser: polyphosphate), water, potato starch, egg white, rapeseed oil, salt, sugar, soya, flavourings (contains crustaceans and molluscs), stabiliser: carrageenan, food colourings: titan dioxide, paprika oleoresin, carmine.